Information: The American fan club for the show 'Battle of the Planets'. It was not official, but it was approved by Sandy Frank Film Syndication. 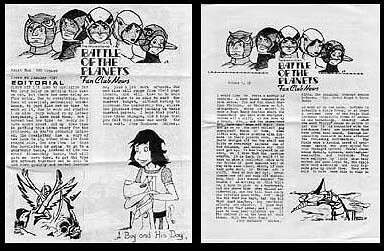 It ran for 5 issues and contained reviews of Battle of the Planets episodes, information on merchandise, cartoons, translations of Gatchaman articles from Japanese sources and general commentary. This publication was known for the first issue, as the 'The International Gatchaman Fan Club Newsletter'.